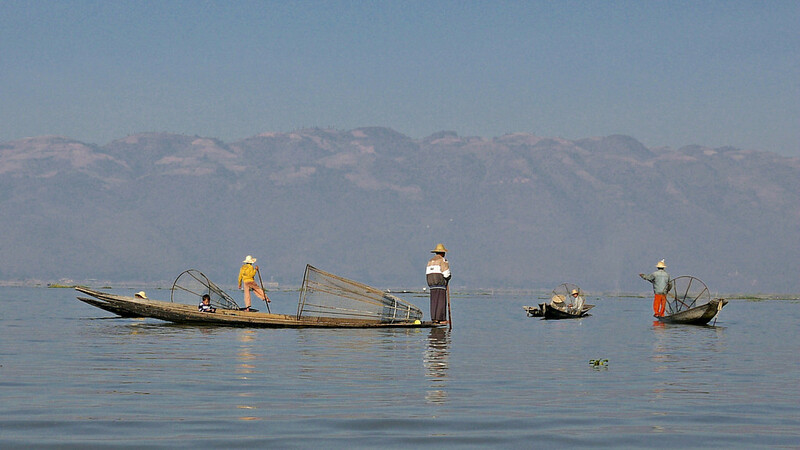 Men fish the shallow waters of Inle Lake from long, flat wooden boats at Inle Lake in Burma (Myanmar). This epiphany carried over to the present, and into my days navigating the marshy waters, thin canals and open expanse of rippling waters on Inle Lake in Burma last month. The most iconic photos of Inle Lake picture the fishermen, their conical nets resting on long wooden boats as the men paddle with one leg wrapped like a vine around the wooden oar digging into the placid lake waters. It’s a beautiful, practical custom that, in all its “foreignness” to the Western eye, pulled my focus as I marveled at the old-school nets in place of a modern fishing pole, the lazy motion of leg-led rowing and not a boat motor. 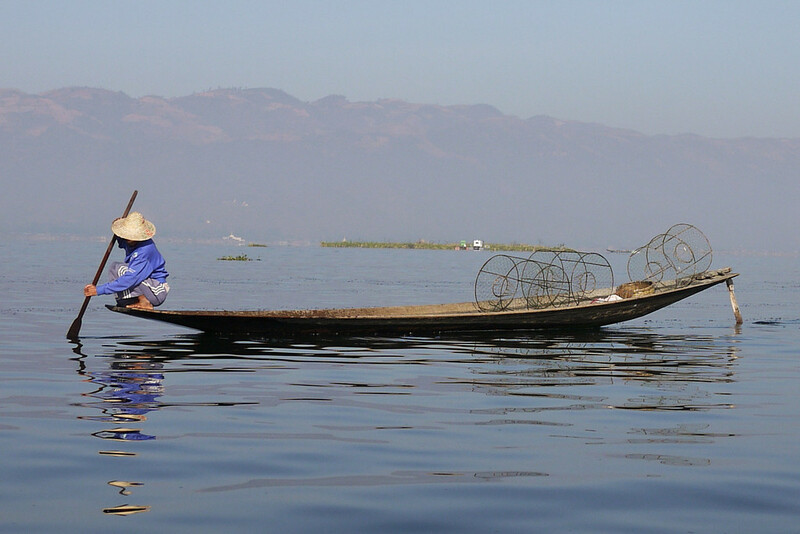 The male fishermen stand on the bow of the boat so they can see down to the lake floor, and their legs are a powerful way to more easily row through the marshy weeds that grow nearly to the surface since Inle Lake averages just seven feet deep. 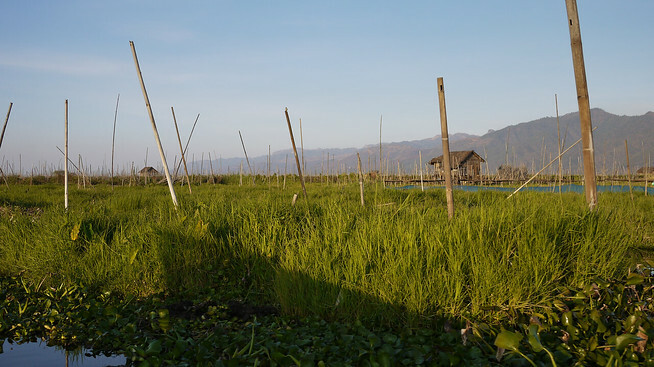 Looking deep into the weeds and water grass, the fishermen on Inle Lake fish for both trade, and for their dinner! 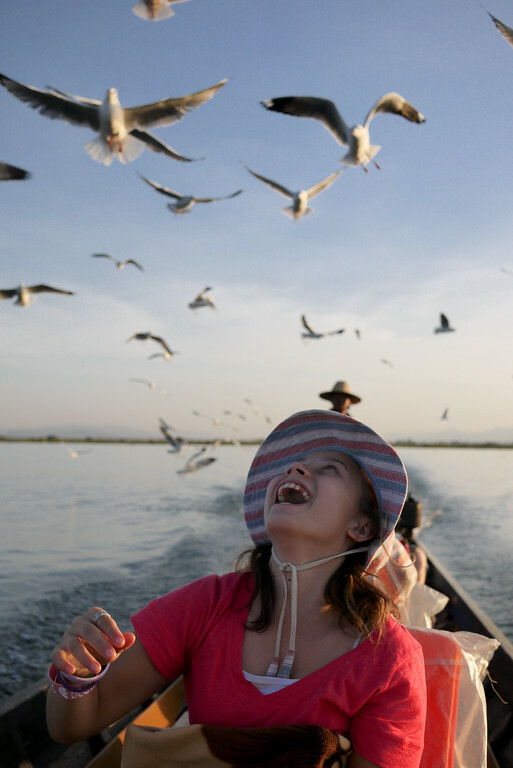 But that’s just one tiny, indelible piece of life on Inle Lake. 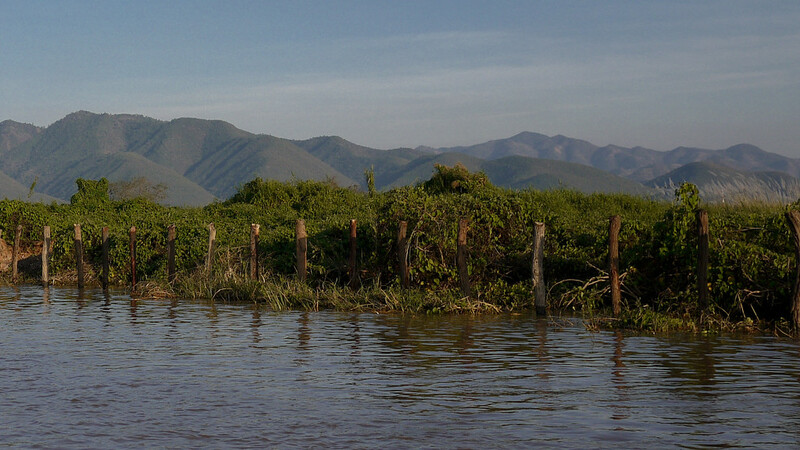 The super productive ecosystem around this shallow 44.9 square mile lake created a separate lake culture, different from the Bamar majority in Burma, and even different from the Shan minority group, even though Inle Lake is within Burma’s Shan State. Instead, an Intha culture and language grew, specific to Inle, where the lake and its ecosystem have allowed the culture to thrive. 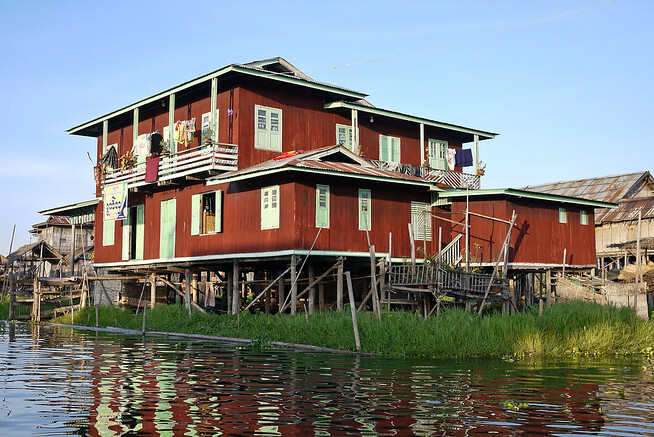 A tall wooden stilt house sits over the canal waters, laundry drying in the sun and boats stored underneath! The villages embraced their creativity over the years in order to make this lake environment their home. Myths even surround the founding of the culture–some believe a former king banished part of the Royal Army from Burmese land, and to keep their word they created moved onto water! Floating land created from dried and hardened weeds and floating hyacinth secure the floating huts and bamboo villages to one fixed spot. Dense vegetation on the floating gardens, in particular, stop-light red tomatoes grow well in this ecosystem. And once the Intha mastered the floating land, then agriculture became a cinch—after all, they have an endless supply of water. 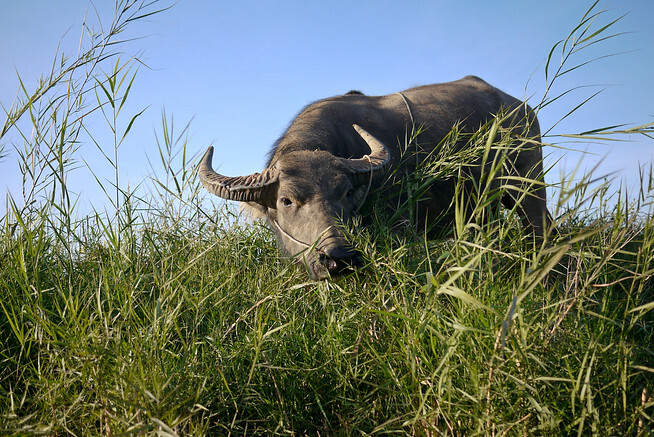 So, as our driver navigated the canal waters, I watched farmers slosh around their cultivated square farms of land, marveling that oxen and humans both easily traipsed around the water farms. 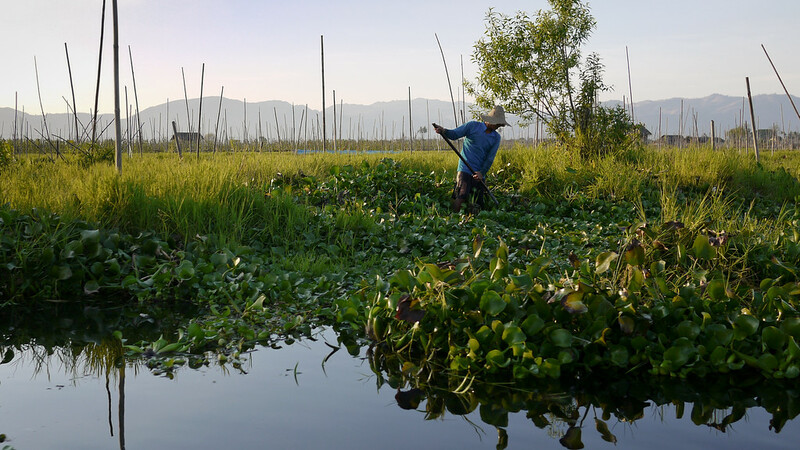 Some farms are kept on much thinner land, and miles of fragrant tomato plants tumbled over each other on the lakes surface, beautiful birds dipping into the canals near the gardens when they spotted fish from above. 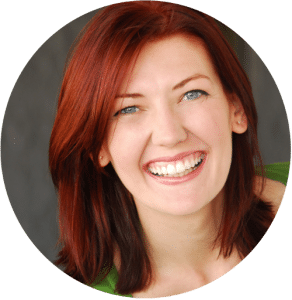 So, now you’re wondering, okay, they have stilt houses, floating land for farming, and gardens, but why doesn’t it all just float away? I puzzled over this mystery, I even spent time musing out loud about hundreds of 10 foot tall bamboo sticks poking out from the lake in every direction. Ah, the sea of khaki colored bamboo affix a garden to the lake surface. Then, the gardens are tended, sold, and moved if need be in the future. The entire lake sustains a purpose-built community around the ecosystem. Feeding the seagulls was a highlight of the trip. 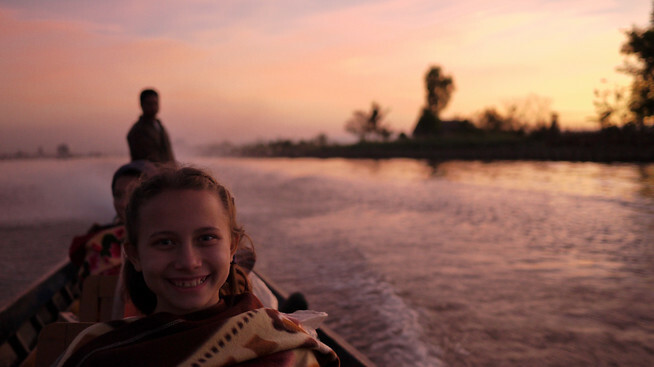 Over the past five months I watched Ana guffaw with laughter at random moments, and smile with patience and curiosity as locals explained the inner workings of something to her, and even frown with concern at the treatment of street animals. And the seagulls on Inle Lake brought sheer joy. She abandoned all thought of being a serious preteen and she and her friend M (from GotPassport.org) threw chunks of deep-fried dough with childish abandon. 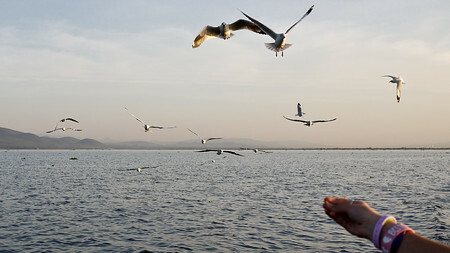 The birds swooped down to pluck chunks out of their hands and noisily fought over bits flung into the air. And as the sun set over Inle Lake, we cozied into our warm blankets and all enjoyed the bite of cool in the air and the squawk of birds tailing our speeding longboat. Far from subtle, behind us a maze of saffron and pumpkin exploded into the sky nearest the setting sun, while a quiet rose tint settled on the surrounding mountains and we jetted back into the small town center for fresh dinner and a warm bed. Sounds gorgeous, looks amazing and I want to be there too… How much did you spend for this journey? Tks for your information! 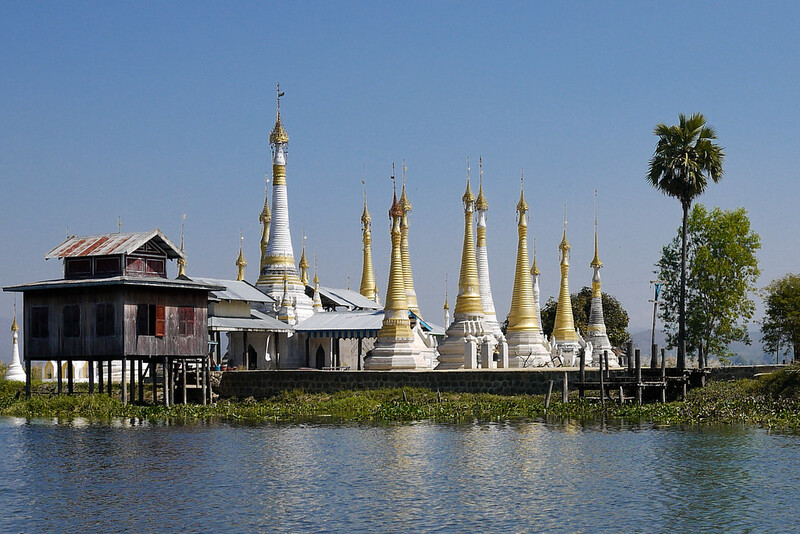 I’m from Burma but i just know a bit about Inlae lake! However, your information is very useful for my cultural presentation! How interesting – I never knew that there was such an intricate system in Inle Lake!! So enjoyed your pictures and lovely-written commentary. You answered lots of questions I forgot to ask while there in December. I LOVE Myanmar and want to return late fall before it changes too much. 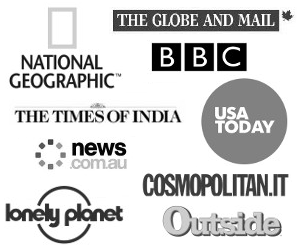 I’d love reading your “top ten” list from your visit. Just discovered your site today. Thank you. Amazing shots! 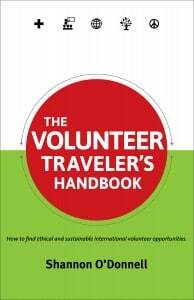 If I ever get to Burma I’ll have to check this out! Seems like they have it figured it out! I love visiting floating villages. That last shot is spectacular!!! I’ve read a lot about Inle Lake lately. It looks and sounds so beautiful. Great photos! Shannon!! its beautiful in snaps..am sure it could have been awesome experience! !